(Undated) – The Crawford County Board will look at the Enterprise Zone as well as handful of other items when they meet tonight. The County Board will approve both the Robinson/Crawford Enterprise Zone Ordinance as well as the Robinson/Crawford Enterprise Zone Intergovernmental Agreement. If approved by the state, the new Enterprise Zone would take effect in 2020. The current Enterprise Zone expires December 31st of 2019. In other business the County Board will also approve the 2018-2019 Tax Levy Ordinance and the 2018-2019 Forest Preserve Tax Levy Ordinance. They will also approve the appointment of Gabe Griffith to the Forest Preserve Oversight Committee. 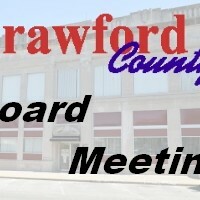 The Crawford County Board meets tonight at 7pm.